One of the arguments most frequently offered for the creation of Ten Commandments plaques, monuments, or displays on government property is that they are the foundation of American (or Western) law. Having the Ten Commandments displayed is thus supposed to be a way of acknowledging the roots of our laws and our government. But is this valid? It is difficult to make any case for the idea that the Ten Commandments, taken as a whole, really constitute the basis for American law. It’s obvious that some of the Commandments forbid actions that are also forbidden in American law, but then again the same parallels can be found in laws throughout the world. Are the Ten Commandments the basis for Chinese law, merely because murder and theft are forbidden in China? Perhaps the problems with this claim will become more clear if we take the Commandments individually and ask where in American law they are expressed. We’ll use a pseudo-Protestant version of the Commandments which is similar to the most popular listings found in public displays. One possible interpretation of the claim that the Ten Commandments are the basis for American law is that "the law," as an abstract notion, has its origins outside of humanity. Laws are ultimately based upon commands stemming from God and are binding upon all people — including kings, aristocrats, and other "higher" members of society. Of course, it is obvious that this is a theological proposition. There is nothing the least bit secular about this, and the government has no authority to endorse such a view. It is even arguably a sectarian theological proposition because it singles out the Ten Commandments for special treatment as coming from "outside humanity," a position which traditional Jews would not accept because they regard the entire Torah has having divine origins. If this is what people mean when they say that the Ten Commandments are the basis for American law, then it's an invalid reason for posting the commandments on government property. Another way of interpreting this position is to see the Ten Commandments as a "moral" basis for the general legal order of the West. In this interpretation, the Ten Commandments are treated as moral principles dictated by God and serving as the ethical foundation for all laws, even if they can't be traced directly back to any specific commandment. Thus, while most individual laws in America don't derive directly from the Ten Commandments, "the law" as a whole does and this deserves recognition. This, too, is a theological proposition which the American government has no authority endorsing or supporting. It may be true or it may not, but it's not a subject on which the government can take sides. If this is what people mean when they say that the Ten Commandments are the basis for American law, then posting them on government property is still invalid. The only way to argue that "they are the basis for American law" is a reason for posting the Ten Commandments on government property is if there is a non-religious connection between the two — preferably a legal connection. We have considered what it might mean to say that American law is based on the Ten Commandments; here, we will look at each commandment to see if any are reflected in any way in American law. Thou Shalt Have No Other Gods Beside Me: There aren’t any laws that forbid the worship of all but one god, much less the specific god of the ancient Hebrews. In fact, American law, in general, is silent on the existence of gods. Christians have inserted references to their God in various places, for example the Pledge of Allegiance and the National Motto, but for the most part, the law doesn’t insist that any gods exist - and who would want that to change? Thou Shalt Not Worship Any Graven Images: This Commandment has the same basic legal problems as the first. There is nothing in American law that even hints at the idea that there is something wrong with worshipping “graven images.” If such a law existed, it would infringe upon the religious liberties of those whose religions include “graven images” — which, according to some, would include Catholics and many other Christian denominations. Thou Shalt Not Take the Name of the Lord Thy God in Vain: As with the first two Commandments, this is a purely religious requirement that is not expressed in American law anymore. There was a time when blasphemy was punished. If it were still possible to prosecute people for blasphemy (a common, but not necessarily accurate, interpretation of this Commandment), it would be an infringement on religious liberty. Remember the Sabbath Day to Rest and Keep it Holy: There was a time in America when the laws mandated that shops close on the Christian Sabbath and people attend church. The latter provisions fell away first and, over time, the former began to disappear as well. Today it is difficult to find laws that enforce any “Sabbath rest” and none that enforce keeping a Sabbath “holy.” The reasons are obvious: this is a religious matter which the government has no authority over. Honor Thy Father and Thy Mother: This is a Commandment that is a good idea in principle, but to which many good exceptions can be found and which is completely impractical as a law. Not only are there no laws specifically designed to require this, but it would also be difficult to find any laws that express it as a principle even some remote sense. A person who curses their parents or ignores or says bad things about them breaks no laws. 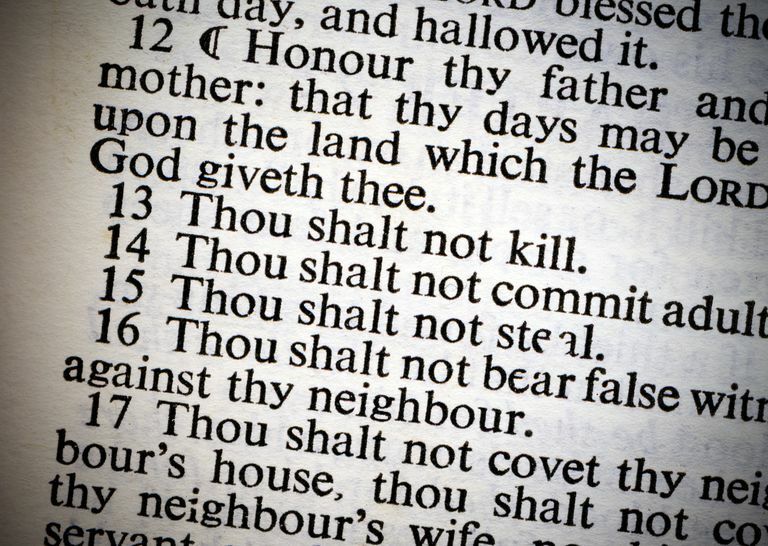 Thou Shalt Not Murder: Finally, a Commandment that forbids something that is also forbidden in American law — and we only had to go through half of the Commandments to get to this point! Unfortunately for Ten Commandments advocates, this is also something forbidden in every known culture on the planet. Are all of these laws based upon the Sixth Commandment? Thou Shalt Not Commit Adultery: Once upon a time, adultery was illegal and could be punished by the state. Today that is no longer the case. The absence of laws prohibiting adultery prevents anyone from arguing that current American law is in any way based upon the Seventh Commandment. Unlike other such Commandments, though, it would be possible to change the laws to reflect this one. The question to supporters of the Ten Commandments, then, is this: do they openly advocate the criminalization of adultery and, if not, how does that square with their insistence that the Ten Commandments be endorsed, promoted, and displayed by the state? Thou Shalt Not Steal: Here we come across just the second of ten Commandments that forbids something also forbidden in American law — and, as with the Sixth, this is also something forbidden in all other cultures as well, including those that predate the Ten Commandments. Are all laws against theft based on the Eighth Commandment? Thou Shalt Not Bear False Witness: Whether this Commandment has any parallels in American laws depends upon how one interprets it. If this is simply a prohibition against lying in general, then it is not expressed in American law. If, however, this is a prohibition against lying in the course of court testimony, then it is true that American law also forbids this. Then again, so do other cultures. Thou Shalt Not Covet Anything That is Thy Neighbor's: As with honoring one’s parents, a command to refrain from coveting may be a reasonable principle (depending upon how it is applied), but that doesn’t mean that it is something that can or should be enforced by the law. There is nothing in American law that even comes close to forbidding coveting. Of the ten Commandments, only three have any parallels in American law, so if anyone wanted to argue that the Commandments are somehow the “basis” for our laws, these are the only three they have to work with. Unfortunately, similar parallels exist with every other culture, and it’s not reasonable to say that the Ten Commandments are the basis for all laws. There is simply no reason to think that the people crafting American or British law sat down and prohibited theft or murder merely because the Ten Commandments already did so. A couple of the Commandments forbid things which were at one point forbidden in American law but are not anymore. If the Commandments were the basis for those laws, they aren’t the basis for current laws, and this means that the rationale for displaying them is gone. Finally, it must be kept in mind that constitutional protections of religious liberty are written in a manner that is practically designed to break several Commandments. Thus, far from reflecting the Ten Commandments, it is arguable that the principles of American law are set up to break several of them and ignore most of the rest.